'd be surprised if any PlayStation 3 owner hadn't heard of Fat Princess. Partly due to rampant delays, along with a well-played hype campaign. Fat Princess has become one of the most highly anticipated games of the summer. As such, the game has been placed on a pedestal — most certainly a situation where it would be highly probable for gamers to be let down when flaws undoubtedly exist. Fat Princess has a flaw. Online match-making can be slow at times. I'm getting that proclamation out of the way very quickly. Reason being, every word beyond this paragraph will be one used to express my love for everything that Fat Princess represents. For the Princess! And her appetite.The main game mode is a capture the flag style match with several enhancements that separate Fat Princess from the average shooter. Done in a three-quarters overhead view with class-based gameplay, class selection is done via a choice of hats that may be changed at any time. The Princess (the flag), a demanding young wench, has an insatiable appetite for cake. Feeding her such delectable delights has the obvious effect and thus earns her namesake. As negative as this might sound, it has favorable repercussions on the battlefield. As the enemy attempts to steal your Princess her widening waste-line make such tasks plodding ones. Various other modes of play, including death match and invasion (a territories-style match) are enjoyable in their own right, while adding varied gameplay and endless replay value to this digital downloadable game. A total of eight maps, each with very distinct terrain, challenge your strategy time and time again. The cherry on top is Fat Princess' very own soccer match: described as a super-fun sport, for which unfortunately no one has yet invented rules. Quite possibly the cutest chaotic bloody mess of a soccer match I've ever seen. Simply divine! Anyone with a passing interest in World of Warcraft — specifically, player-versus-player battlegrounds — will understand immediately how Fat Princess gameplay functions. Furthermore, any gamer that enjoys such play will need to purchase it posthaste. At its core, Fat Princess is a console version of WoW battlegrounds. Essentially it is such play without gear differences, a common complaint of the weekend warriors and warlocks of Azeroth. Every class is endlessly enjoyable.In contrast, a burgeoning list of abilities will not be found in Fat Princess. This isn't a flaw so much as a relief, as plenty of depth comes purely from the game scheme. Instead, a worker class gives very limited upgrades to classes as he bolsters his team's castle. Collecting resources and using them in the proper fashion are included in the worker's duties, be it fortifying the castle gates or upgrading the hat machines found within its walls. Along with his strong offense — once upgraded — the worker is possibly the deepest class of the game. Not to slight the others, every class is endlessly enjoyable. With the varied yet simplistic class abilities, each class appears balanced well enough to earn its place. 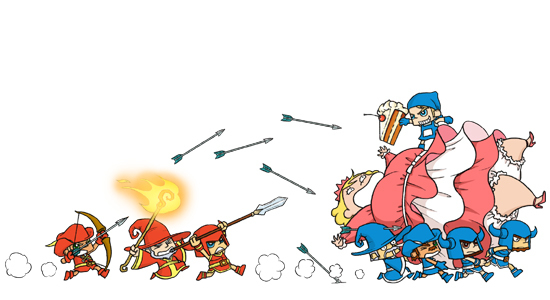 At $14.99, Fat Princess is a steal for anyone who enjoys multiplayer action. A single-player mode is included and is worth a playthrough, though it does not offer enough content to justify its purchase in its own regard. To be fair, this mode seems to be meant as tool to teach the gamer prior to entering the fold of online play. Even the credit sequence is uniquely enjoyable. I'd rather not divulge the details of this, as you must see it for yourself. I could go on, singing praises of Fat Princess, but I'd rather be playing it. So I will.